New York City police officers at the scene of the shoot-out that occurred April 27, 2015, after the funeral service for Jose Luis Robles in Brooklyn. 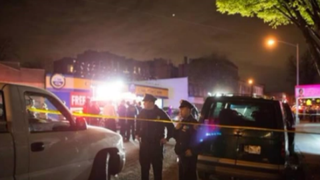 As people poured out of a Brooklyn, N.Y., funeral home after a service Monday evening, three gunmen drove by and fired shots into the crowd, killing two people and injuring six, the New York Daily News reports. The funeral service was held for 39-year-old Jose Luis Robles, who died of natural causes. The assailants began firing shots at around 8:30 p.m., and one of the funeralgoers opened fired in return, wounding one of the assailants, police say. One witness described the pandemonium that ensued after the gunfire. Police think the incident was in retaliation for a conflict that began nearly 20 years ago. Robles was a former gang member, with ties to the Bloods. Police say that rival gang members shot up his funeral as a result of some unknown conflict between the two local gangs. Among those dead are a 44-year-old man who was shot in the chest and a 40-year-old who was shot in the stomach. The suspected assailant who was wounded by return gunfire was found several blocks away. His two alleged accomplices had fled. Despite Robles’ ties to local gangs, one person maintained that the shoot-out “had nothing do with Robles,” a source told the Daily News, and more to do with a dispute that took place at the funeral. Apparently, one of the assailants attended the funeral and got punched by one of the victims. The assailant then left and returned with accomplices and started shooting, according to the report.